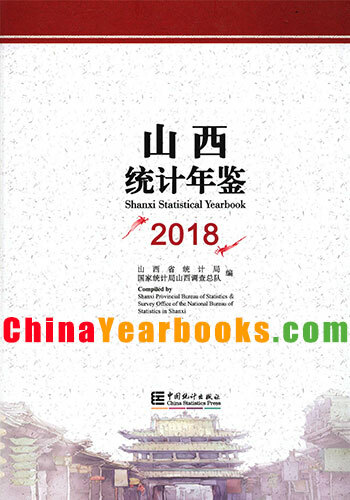 Ⅰ.Shanxi Statistical Yearbook 2018 is an annual statistics publication,which reflects comprehensively the national economic and social development of Shanxi province.It covers data for 2017 and key statistical data in some historically important years at the provincial level and the local levels of prefecture and county.To meet the need of international exchange,this yearbook is made in both Chinese and English. Ⅱ.The yearbook contains the following twenty parts:I.General Survey;2.Population,Labor Wages and Social Security;3.Price;4.People’s Livng Conditions;5.Public Finance,Banking and Insurance;6.Energy;7.Investment in Fixed Assets;8.Foreign Trade and Economic Cooperation;9.Agriculture;10.Industry;11.Construction;12.Real Estate;13.Wholesale and Retail Trade;14.Hotels,Catering Services and Tourism;15.Transportation,Post and Telecommunication Services;16.Education,Science and Technology;17.Culture,Sports,Public Health and Environmental Protection;18.General Survey of Cities;19.Cities at Prefecture Level;20.Counties,Cities and Districts at County Level.To facility readers,Statistical Charts reflecting total trend are attached at the beginning of each chapter,and Explanatory Notes on Main Statistical Indicators,a brief introduction about the meaning,statistical coverage,statistical methods and historical changes of main statistical indicators,are provided at the end of each chapter. 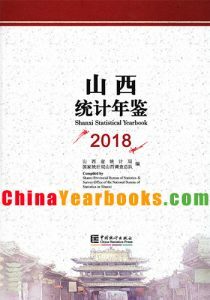 Ⅲ.Comparing with Shanxi Statistical Yearbook 2017,following revision has been made in this new version:historical data of GDP are adjusted according to the new change of National Accounting System in the chapter of General Survey;Investment in Fixed Assets adopts new statistical coverage in the chapter of Investment in Fixed Assets,because Shanxi has been chosen as the investment statistics reform pilot province in2017;historical data of agriculture are adjusted according to the Agricultural Census and Table of Agricultural Machinery is added in the chapter of Agriculture;Value Added of Industry is deleted and parts of financial indicators are adjusted in the chapter of Industry;Bussiness Volume of Post and Telecommunication Services is deleted in the chapter of Transportation,Post and Telecommunication Services. Ⅳ.The statistical coverage and explanation of indicators in this yearbook are the same as the current national statistical report system.The data in this yearbook are mainly obtained from annual statistical reports,and some are from sample surveys and related departments. Ⅴ.For the convenience of the readers,brief notes concerning some indicators about their changes in meaning or coverage are given at the lower part of relevant tables.In case of some statistical data issued before being inconsistent with this publication,take the data in this publication as correction. Ⅵ.The units of measurement used in this yearbook are international standard measurement units.Statistical discrepancies due to rounding are not adjusted in this yearbook. Ⅶ.Notations used in this book:”(blank)” indicates that the figure is not large enough to be measured with the smallest unit in the table or is not available;”#”indicates the major items of the total.